Illustrations: 7 figures, 7 tables, 3 maps. 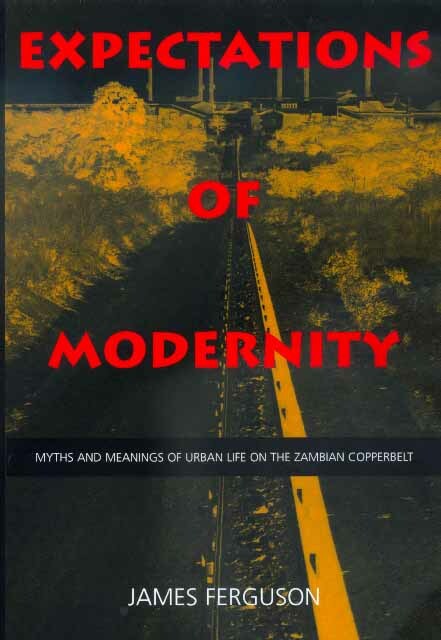 Ferguson shows how the Zambian copper workers understand their own experience of social, cultural, and economic "advance" and "decline." Ferguson's ethnographic study transports us into their lives—the dynamics of their relations with family and friends, as well as copper companies and government agencies. Theoretically sophisticated and vividly written, Expectations of Modernity will appeal not only to those interested in Africa today, but to anyone contemplating the illusory successes of today's globalizing economy. James Ferguson is Associate Professor of Anthropology at the University of California, Irvine, and the author of The Anti-Politics Machine: "Development," Depoliticization, and Bureaucratic Power in Lesotho (1990). He is also coeditor, with Akhil Gupta, of Anthropological Locations: Boundaries and Grounds of a Field Science (California, 1997) and Culture, Power, Place: Explorations in Critical Anthropology (1997).